Pauline Ibbs was the first woman to be appointed Rector of St Thomas More College and the first lay person to hold the position. Pauline was born in Perth in 1950 and was educated at Iona Presentation College. Pauline joined the College in 1996 and in 2002 was appointed as Vice-Rector, a position she held for eight years. In 2010 she was asked by Archbishop Hickey and the Chair of Council if she would be prepared to take on the position of Rector. She willingly deferred her retirement to take up the challenge. 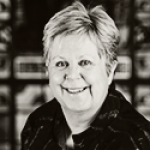 During her time at St Thomas More College, Pauline’s rapport with students was instrumental in developing a strong culture of community within the College. She was actively supportive of the of the College’s Cambodian Outreach Programme. After 17 years of service with the College, Pauline retired at the end of 2012. She remains active in the broader College community and remains in contact with many ex-Collegians from around the world. 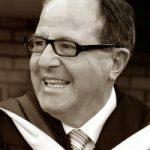 Born in Newcastle, NSW and educated at Rostrevor College, Adelaide, Br Rob Callen entered the Christian Brothers in 1969. He studied at the Universities of Melbourne and graduated from the University of Western Australia. Br Callen’s teaching assignments took him to St Mark’s College, Bedford, Christian Brothers College, Kalgoorlie, and Trinity College, Perth; all in Western Australia. He then spent a year studying in Dundalk, Ireland where he received his Graduate Diploma in Religious Education. From 1986 he taught at Rostrevor College, Adelaide until his appointment as Principal of Saint John’s College, Whyalla. In 1988 he lead the first group of student volunteers on a pilgrimage through India. 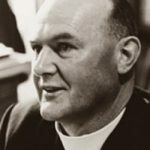 In 2001 Br Callen returned to Trinity College, Perth as Campus Minister and introduced the Kairos Retreat, Peer Ministry and the Christian Service program. 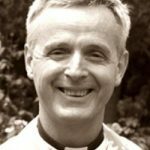 In 2006-2008 he completed his MA in Pastoral Ministry at Boston College, U.S.A. On his return to Perth, Archbishop Hickey appointed him Rector of St Thomas More College. In his two years as Rector of the College, Br Callen brought many aesthetic changes to the College including the upgrade of the Senior Common Room and the small dining room, giving patron Saints names to the residential blocks, building a giant chess board and providing garden seating. By upgrading all of the College’s marketing materials and introducing a new website, Br Callen lifted St Thomas More College’s profile in a highly competitive market. Br Rob’s passion for social justice was evident in his establishment of the Tommy More Outreach program. His support for the College Choir and the Sunday evening community Eucharist were highlights of his short time at the College. Mgr Kevin Long was born in Melbourne and educated by the Christian Brothers. He entered the seminary in Melbourne and was ordained in 1981. He spent some years at New Norcia before coming to St Thomas More College to commence studies on his PhD at the University of Western Australia. He was appointed Vice Rector in 1994 and the Rector in 1999. Mgr Kevin Long was the first diocesan priest to hold this position after the Jesuits withdrew from the College. He was Rector for 10 years until his appointment in 2009 as Rector of St Charles Seminary, Guildford. Born in the Netherlands, Fr. Overberg’s family emigrated to Australia while he was still a child, and he was brought up just outside Ballarat, where he was educated by the Christian Brothers. He entered the Society of Jesus in 1965, and was ordained in 1978. He served first as Vice Rector of Aquinas College at the University of Adelaide, then as Rector there, before transferring to St Thomas More College in 1997. He served as Rector here for two years, then took up the post of Master of Novices for the Australian Jesuit province. Fr. Overburg returned to Perth in 2009, where he continued to serve as the parish priest of Holy Rosary Church in Nedlands. Fr. Quinlan was born and bred here in Perth, attending St Louis School, Claremont, before entering the Society of Jesus in 1954. He studied for five years, and then returned to St Louis to teach, before going on to the University of Melbourne, and degrees in history and psychology. 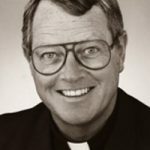 He was ordained in 1967, after which he spent a number of years in the United States pursuing postgraduate studies in both psychology and spirituality. Fr. Quinlan was appointed as Rector of St Thomas More College in 1991, and served in that role until 1996. Shortly after his departure from the College, he was taken ill, and fought a four-year battle against cancer until his untimely death in 2001. He was a much-loved member of the College community, as witnessed by the fact that the College named one of its conference rooms in memory of him. A New Zealander, Fr. Bishop was educated by the Marist Brothers, and at the Holy Name Seminary, before entering the Jesuits in 1958. Studies at the University of Melbourne and in Boston followed, before he was appointed to a lecturing post at the Jesuit Theological College, and then Rector of that College in 1975. Between 1982 and 1884, Fr. Bishop taught in his native New Zealand, then returned to Australia, having been appointed as Acting Rector of St Thomas More College in 1985, and to the substantive post early in 1986. He served in that capacity until 1986. It was during Fr. Bishop’s time as Rector that the first female Vice Rector, Janice Raggio, was appointed. Born in Malvern, and educated at Xavier College, Fr. Bill Uren entered the Jesuits in 1954. 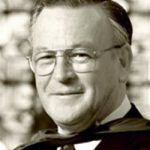 He studied at the Universities of Melbourne and Sydney, before being ordained in 1968, at which time he was appointed as Dean of Newman College. In the early 1970s, Fr. Uren travelled to Oxford to undertake postgraduate studies in philosophy, before returning to Australia, and becoming attached to St Thomas More College. He was appointed as Acting Rector in 1979, and confirmed in that position in December of that year. Fr. 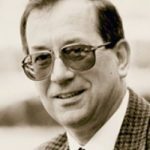 Uren continued his links to residential educational establishments when he left St Thomas More in 1984, going on to Rector of Newman College between 1987 and 1991, then taking a break to serve as Provincial Superior, then as Rector of St Leo’s College at the University of Queensland. Fr. Uren was appointed to the Rectorship of Newman College for a second time in 2006, a post he currently holds. Born in Melbourne, Fr. Hamilton-Smith entered the Society of Jesus in 1934, and was ordained in 1949. Initially appointed to the promotion of missions in India, Fr. Hamilton-Smith soon returned to Australia, and was appointed to Riverview College in New South Wales, and then to St John Fisher College at the University of Tasmania. 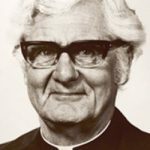 He was Rector of St Thomas More College from 1975 until 1978, at which point he returned to Melbourne, with responsibility for editing the magazine ‘Madonna’. Fr. Prendiville was born in Northam, and educated at St Louis School in Claremont, before joining the Jesuits in 1945. He studied Arts at the University of Melbourne, then took a Masters degree at the University of Oxford, then gained his doctorate at the University of Innsbruck. 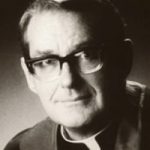 He lectured, and was briefly Rector of the Jesuit Seminary at Glen Waverly, Victoria, before being appointed to St Thomas More College in 1972. It was under Fr. Prendiville that women first enrolled at the College. Fr. Prendiville went on to lecture at the College of Divinity and at the WA College of Advanced Education, before returning in 2000. He still lives in Perth, devoting his time to writing and preaching. Born in Kalgoorlie, Edward Stormon attended Perth Modern School before working to pay his way through courses in English and Italian on a part-time basis at the University of Western Australia. As a priest, Fr. Stormon taught at St Louis School in Claremont, and hosted a program entitled ‘The Catholic Answer’ on local radio. 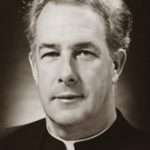 Dean of Students at Newman College, Melbourne, in the 1950s, Fr. 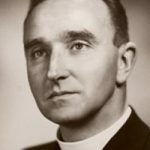 Stormon was appointed Rector of St Thomas More College, and returned to Perth in 1963. He remained at the College for eight years, in which time he also lectured in the Italian and the French Departments, as well as holding a seat on the University Senate. A widely published academic, Fr. Stormon returned to Newman College in 1971, and then taught at the Jesuit Theological College, as well as at the University of Melbourne. He remained at the College for eight years, in which time he also lectured in the Italian and the French Departments, as well as holding a seat on the University Senate. A widely published academic, Fr. Stormon returned to Newman College in 1971, and then taught at the Jesuit Theological College, as well as at the University of Melbourne. An Irishman by birth, Fr. Hogan had been Provincial Superior of the Jesuits here in Australia until the appointment of Fr. Boylan to that post mid-year in 1962. As a result, Fr. Hogan agreed to take on the Rectorship of the College on a short-term basis, and served for the remainder of that year, before returning to the eastern states, where he lectured in canon law. Our first native-born rector, Fr. Boylan was born in Kalgoorlie, though educated in Ireland and Europe. Having served as both a teacher and as rector of Xavier College in Melbourne, Fr. Boylan was appointed to St Thomas More College in 1960. He was with us for only a year-and-a-half, however, before being called back Melbourne, where he was appointed Provincial Superior of the Australian Jesuits. 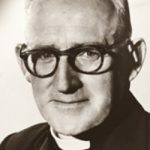 Our Foundation Rector, Father Finn was born and schooled in Ireland, travelling to Australia as a young priest in 1942, where he took up a teaching post in Watsonia, Melbourne. Responsible for much of the original building plan for St Thomas More College, Fr. Finn also gave us our motto, ‘God’s Servant First.’ Fr. 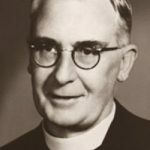 Finn undertook a number of teaching posts upon leaving the College in 1959, but in his later years was best known as a spiritual director and retreat organiser.